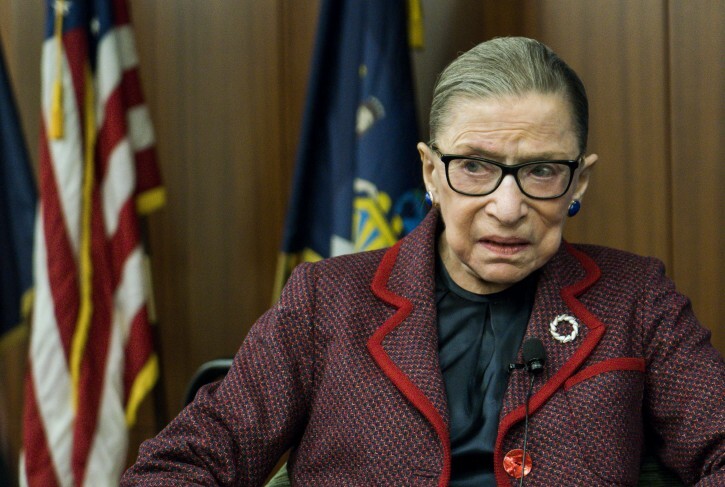 Washington - Eighty-five-year-old Supreme Court Justice Ruth Bader Ginsburg fractured three ribs in a fall in her office at the court and is in the hospital, the court said Thursday. I wish she doesn’t return to the court. The dem-o-rats, media will go psycho. They are already so crazy! I wish her a full & speedy recovery. May she have a refuah, and let this be her clarion call to get the hell off the court! This way a normal, reasonable centrist justice can be appointed. Ginsburg it's time to retire. Don't worry whom the president will nominate. You will be able to watch the nomination circus on CNN. Please check your vitamin d levels. > " If a justice is in some way incapacitated or otherwise prevented from discharging their duties, there currently is no [Constitutional] mechanism for outside forces to remove said justice from the bench." However, if the justice left a "will" (advanced directive) on what to do in case of incapacitation, then depending on exactly what steps the "will" makes, it may be possible to legally assume that the judge has retired. “Tests showed that she fractured three ribs on her left side and she was admitted for observation and treatment,"
— probably from leaning too far left. There are no more oral arguments scheduled for 3 weeks, so chances are she will not miss any cases. But, if she did, yes the cases would be decided by 8 justices. I think that the situation involving a "will" is interesting theoretically, but can't imagine even in the current political climate anyone acting based on an "assumption" that she retired. She is the Associate Justice until she resigns or dies or is impeached. If it stayed at 8 Justices Conservatives would Party with a 5-3 Majority. Unless new swing vote Chief Justice Roberts joined the libs all would be great! My word, I'm new here...but if posts like what I see here are indicative of anything, Voz Iz Neais is populated by run of the mill disrespectful far right yahoos...where is their Yiddishkeit? Where is your Yiddishkeit ? Don't be shocked. Not everyone on VIn is Jewish. And most posters had no connection to "Yidischkeit" Watch out especially for not Yiddish sounding names. Better be careful. Edumacated "Archy" is going to claim you're just another screen name of a mythical Yoni. People with strong beliefs generally do not respect those with differing opinions. This is usually true, whether or not they practice Torah, as seen right here. First and foremost Refuah Shleimah. Second, I knew first hand a religious girl who served as her clerk (a huge honor), and RBG made sure that she was always in plenty of time for Shabbos and Yom Tov. I agree, we are a pretty uninformed crowd. “ I wish she doesn’t return to the court. Get your next Supreme Court pick ready, Pres. Trump! Could you imagine Trump gets to pick another SC justice? The libtards would go nuts.... Wait they did that with Kavanagh already.